Jason Krizan could have walked away from the Tigers after the 2017 season. An eighth-round pick in 2011 from Dallas Baptist, he had reached Triple-A the past three seasons, only to get passed over for promotion. But Krizan doesn't seem ready to go without a fight. 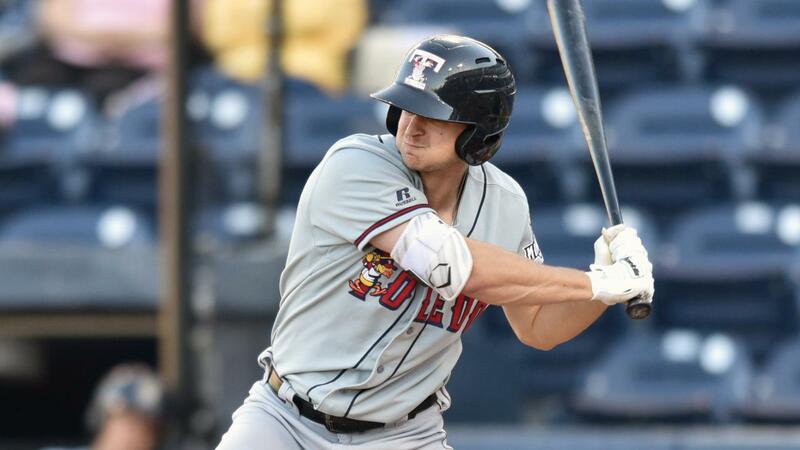 To that end, the designated hitter homered twice, doubled twice and drove in six runs as Triple-A Toledo routed Indianapolis, 13-3, on Monday at Victory Field. In doing so, Krizan became the first Mud Hens player to plate at least six runs since Chad Huffman turned the feat on Sept. 1, 2016. The 28-year-old skied a three-run homer to right field in the first, doubled to right in the third, doubled to right again in the seventh and blasted another three-run shot to right in the eighth to cap the onslaught. Krizan could always hit. He set an NCAA Division I record in 2011 with 37 doubles and set a DBU mark with a 39-game hit streak. But two homers, six RBIs? Nope. "Not in pro ball," he said. "After I hit the second double off the wall, I talked to [manager] Doug [Mientkiewicz] and he said, "Good hit." I said, 'I want another homer,' because I had never done that in professional ball. He laughed and said, 'Well, you know what Manny [Ramirez] says. Everybody can hit one.'" Krizan is not known for his power -- nine homers in 2016 stand as his career high -- and he was just going with his normal approach Monday. "I wasn't trying to hit home runs tonight or anything like that," he said. "I've always been a gap-to-gap guy. I was just trying to hit a ball up the middle and they just flew out. I hit the home runs to the short part of right field." The left-handed hitter went yard off Indians right-hander Austin Coley in the first and righty Tyler Jones in the eighth. In his Triple-A debut, Coley (0-1) did not get out of the first. He was charged with six runs on seven hits in two-thirds of an inning. Espinal, who hit .323 for Indianapolis in 2017, collected three singles and drove in three runs to back 25-year-old right-hander A.J. Ladwig (1-0), who allowed a run on four hits in five innings. It was the worst loss for the Indians in the history of the series between the clubs. Krizan, who will turn 29 on June 28, became a free agent after the season, only to return on a Minor League deal. He looked around, but ultimately decided to return to the only organization he knows. "At the end of the day, the Tigers were really the only team I felt comfortable coming back to," he said. "The bonus was with the coaching staff and a new manager at Triple-A. It was like coming to a new team." He clearly isn't ready to say goodbye to the Tigers or baseball. "Getting to the big leagues is always the No. 1 goal," the native of Austin, Texas said. "I've always been huge on getting to the big leagues. That's the ultimate goal in baseball. I think an opportunity's going to arise."